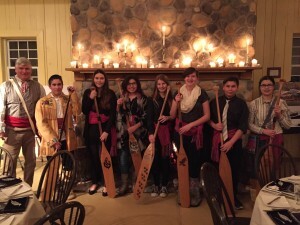 In January 2016, ISEF in partnership with the Canadian Canoe Museum, launched the first joint workshop combining paddle making through the Paddles Across Canada Program and the Tillikum Lens photography program. Eight students came together with their instructor at Lockport School just north of Winnipeg on January 25. Over the next week these students created incredible paddles and fantastic images but more importantly they created a magical experience. They pulled together as a group under the expert leadership of retired teacher Mark Blieske and they demonstrated just how powerful images and art can be. But I have to say that what made the night,…. was the presence of eight aboriginal youth from Lockport Junior High School, who had participated in the Tillikum Lens project that preceded the dinner. This, as you know, is a new partnership we have established with the International Sustainability Education Foundation and its ED, Jonathon Reynolds. Through Jonathon and a remarkable retired woodworking teacher, called Mark Blieske and the people at SONY Canada (who provided cameras) and, of course, the Principal of Lockport School, Daryl Loeppky, some kind of magic happened that transformed the night from a dinner about the Cdn Canoe Museum to a canoe-engendered conversation about a renewed Canada, led and inspired by Mark Blieske and his students. ….. but it was when their “valedictorian,” William Miller, stood at the podium and spoke on behalf of his classmates about their experience … that’s when the shift happened. Something quite remarkable had happened here. The workshop garnered quite a bit of media attention with TV crews from both CBC and CTV visiting the students at their workshop.